But seriously, the VRisk folks decided it was time for an online facelift, and they turned to uber-designer Celia Stratton of Landam Design Works. Celia brought me in as a technical consultant, and the rest is history. Celia and I have a great working relationship, and it's always fun to work with her. Basically, she makes everything look fantastic, and I make everything work as a real live website. So for me that means lots of CSS work, turning her designs into a working, standards-compliant site. In this case, we also threw in some pseudo-flashy coolness on the home page, courtesy of the JQuery Cycle plugin. Fun Fact #1: Celia is my sister-in-law. If you want to contact Celia, you can do so at landamdesign at gmail dot com. 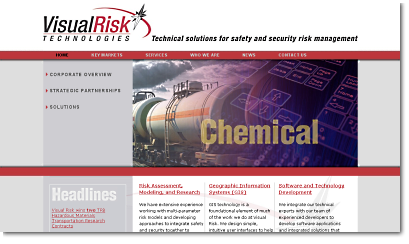 VRisk.com was created using lots of plain 'ole HTML and CSS goodness. Any client-side stuff was done using JQuery.